It’s New Year’s Eve and Brendan is working late. Dejected and bored, he is in no mood to celebrate but a chance encounter with a girl changes everything. Striking 12 is a warm and funny retelling of Hans Christian Anderson’s The Little Match Girl. Set in modern New York, this production has updated the classic fairy tale with a sweetness that does not lose the touching sadness of the original story. Declan Bennett and Bronté Barbé do a good job as the titular characters Brendan and the Match Girl. Barbé plays the vulnerable fairy tale Match Girl as well as the modernised one who sells Seasonal Affective Disorder (SAD) lamps instead of matches. This may seem like a bizarre way to update the story, but it works well to paint a picture of Brendan as an overworked bah-humbug New Yorker. With exposed brick walls, malleable staging and use of vintage lighting, the Union Theatre is also a wonderful space for a show set in New York. The use of matchboxes as tickets and matches on stage was also a great added touch. Along with the talented Andrew Linnie on piano, Kate Robson-Stuart and Leon Scott brilliantly switch between acting and playing multiple instruments to infuse the story with perfect comedic timing. There are some fantastic numbers, particularly ‘Matches for Sale’ and its reprise in ‘Say What?’ Put together, the songs tell the story of The Little Match Girl, and then self-consciously play with what a modernised version of the story would look like. In doing so, Oliver Kaderbhai’s careful direction blends the tenderness of the fairy tale with modern wit. 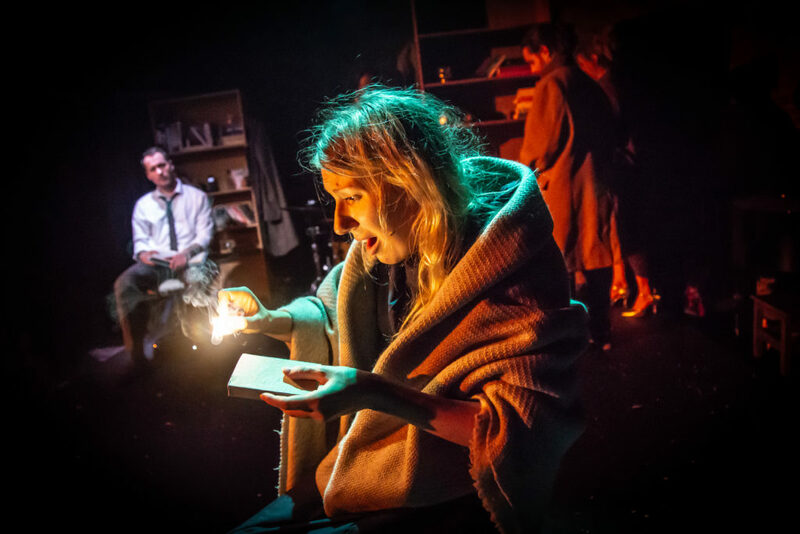 The show’s real magic is held in the hands of Danielle Kassaraté whose Narrator is effortlessly charismatic, adding some fantastic moments of empathy and humour. This is a tight performance that strikes the right tone throughout. Without falling into the trap of irritating unwarranted optimism that so often taints musicals at this time of year, Striking 12 tells a festive story with a hilarious mix of cheer and cynicism. It will end the year with a lovely, simple message: that sharing some sincere festive spirit can make us less sad, and failing that, there’s SAD lamps.